In the video that is being circulated online, the police officer is seen firing shots in the air to match the beats of the song. 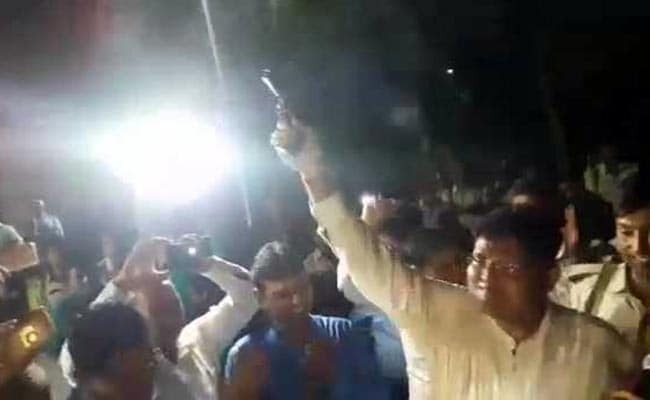 Patna: A police officer in Bihar celebrated his transfer to the CBI by firing in the air at his farewell party, but that appointment now stands cancelled after his recklessness was caught on camera. Siddharth Mohan Jain, the Superintendent of Police at Katihar, was shifted to the CBI or Central Bureau of Investigation as part of large-scale transfers of top officers by Chief Minister Nitish Kumar. While many have been shunted out, Mr Jain was among those who got what they wanted. The Indian Police Service (IPS) officer had applied for a transfer to the CBI. That order has now been cancelled. In a video that is being circulated online, Mr Jain is seen standing next to an officer, Mithilesh Mishra, who is singing a popular Hindi film song on friendship. It was their joint farewell party and went on till late night. Suddenly, Mr Jain is seen firing shots in the air to match the beats of the song from the superhit Sholay. He allegedly fired nine shots at a golf course. No one was injured but the irresponsible display by a top police officer was shocking to those who watched the video. "Jain's deputation to the Central Bureau of Investigation is cancelled and an investigation into the incident is on," said senior police officer SK Singhal. Celebratory firing in the air, still a tradition at weddings in parts of northern India, often turns deadly when stray bullets hits people. No case has been registered against the police officer for misuse of his official weapon. Another video has caught an outgoing Superintendent of Police, shifted from Munger to Bhagalpur, dancing with abandon on the road with a large group, wearing a marigold garland.